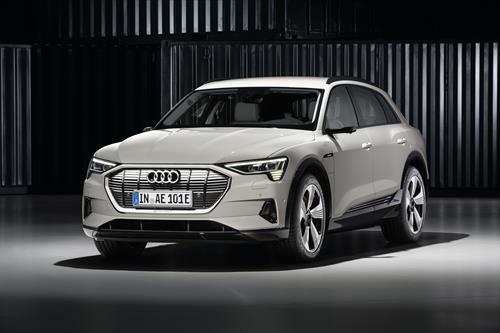 With the introduction of the Audi e-tron, the Audi brand presents its first fully electric production model. The mid-size SUV is electrified, performance oriented and fit for every aspect of daily life. In combination with a comprehensive range of available charging solutions for home and on the move, customers can enjoy fully electric driving without compromise. Maximum tow rating when properly equipped with towing accessories. Vehicle load, other accessories and options may reduce maximum towing capacity. See vehicle owner’s manual for details. Audi Navigation plus depends on signals from the worldwide Global Positioning Satellite network. The vehicle’s electrical system, and existing wireless and satellite technologies, must be available and operating properly for the system to function. The system is designed to provide you with suggested routes in locating addresses, destinations and other points of interest. Changes in street names, construction zones, traffic flow, points of interest and other road system changes are beyond the control of Audi of America, Inc. Complete detailed mapping of lanes, roads, streets, toll roads, highways, etc., is not possible, therefore you may encounter discrepancies between the mapping and your actual location. Please rely on your individual judgment in determining whether or not to follow a suggested Audi navigation plus route. What’s New with the 2019 Ram 1500?